We are so pleased to offer a selection of gift packs and product bundles for you to choose from. Looking for a gift for someone special? Or just restocking your favourites MooGoo products? 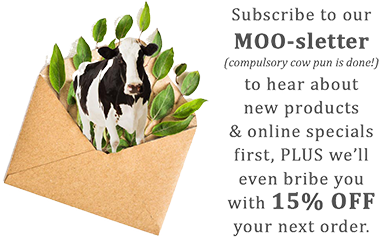 Our product packs provide MOO-velous savings for buying in bundles. If the pack is meant to be a gift, and you would like to include a special message on a card, simply check the box “This is a gift. Please pack in a gift box.” and write out your personalised message in the “Gift Message” box below. We will write that message onto a card that will be included in the package. Don’t forget to say who it’s from! Our favourite and most-popular MooGoo Essentials. A great starter kit! All of our favourite and most-popular products to help combat dry, flaky, thirsty skin. All of our favourite and most-popular products to help soothe skin irritations. A great starter kit! Filled with all of the products you need for a new addition to the herd! Also a perfect gift for new mums containing everything they need to care for their baby’s skin.